All that remains of this LONG forgotten Liliw production is the poster, starring popular martial artist and comedian Ramon Zamora as "Chopsuey", reprising his character from the 1975 Bobby A. Suarez production They Call Him Chop-Suey, and a twenty year old Weng Weng playing "Big Time Papa" in what could be his very first film. The poster even lists his vital statistics: "Weight 30 pounds, redbelt master, blood pressure 120/80"!!! 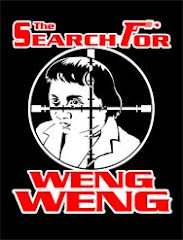 An early film for Pete & Cora Caballes, the husband and wife team who discovered Weng Weng through his martial arts instructor, formed Liliw Productions (later Liliw Films International) and sold Agent Double O to the world. When Cora was elected as a councillor in Manila, both Liliw’s output and Weng Weng’s career came to a grinding halt. The couple divorced in the late Eighties. Peter returned to his native Liliw in Laguna where it is believed he owned a resort and passed away around April 2007; Cora is a successful businesswoman who spends much of her time in the United States.